The one thing that my partner asked for for Christmas was for me to revamp our basement into a man cave for him. I thought that would be such a fun project so I immediately started searching for man cave bar ideas that would liven up an unused corner downstairs. This awesome space was my top inspiration picture because the lavishly paneled bar area and coordinating trim was elegant enough to blend well with the rest of the decor in our home, yet still masculine enough for him to enjoy with his buddies. With my bar design picked, I moved on to what type of man cave furniture we would need for extra seating. My immediate thought was rich brown leather couches, but I did not want to spend thousands of dollars on just couches. I was fortunate enough to land a client who had just designed and remodeled a man cave in their home. The good news is that it came with a complementary set of rosewood man cave chairs, which outstandingly matched the travertine-tiled floor. I could already picture a magnificent rustic theme as soon as I walked through the door. We designed the layout with two principal sections, a man cave bar area plus a gaming space. 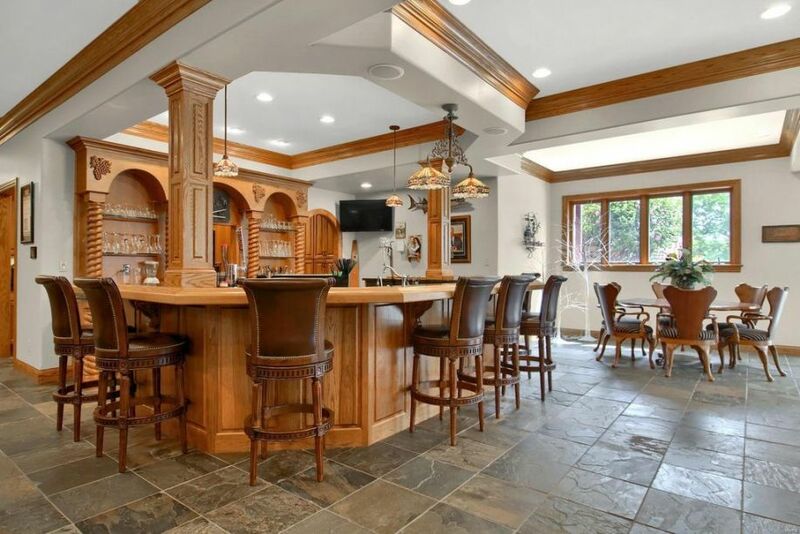 For the bar, I set up two rosewood-sided counters opposite each other, complete with light-brown marble countertops. Then to break their monotony, I chose a different grain for the side panels and accentuated some of the corners with gothic-styled carvings. I absolutely love working on man cave designs because they incorporate a lot of fun features and funky touches that I ordinarily could not incorporate in other main living areas of the home. This basement hideaway is perhaps my favorite man cave that I have finished because it has the perfect balance period architecture, traditional style and awesome contemporary touches. 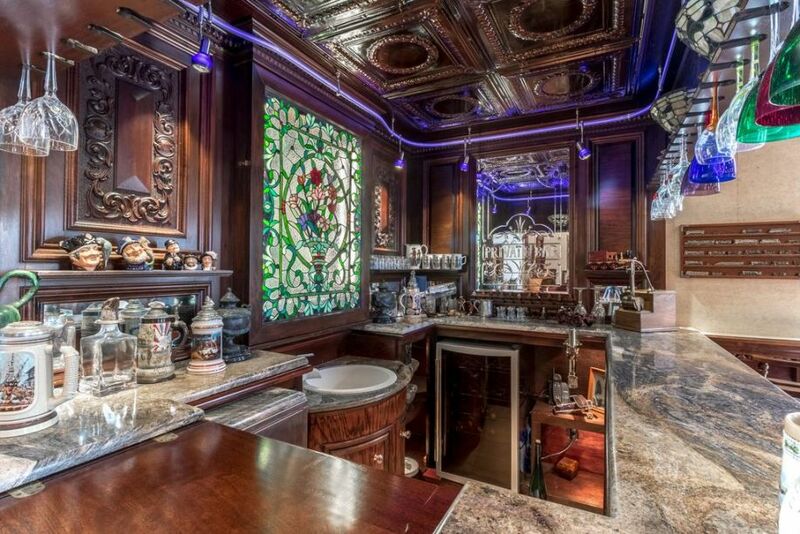 We used this as the starting point for the design and built upon it with rich wood paneled walls, an antique stained glass window and classic man cave accessories like plenty of shelves to store their crystal cocktail glasses and collection of beer steins. I was inspired by the intricate hammered tin ceiling that I found at a local estate sale. 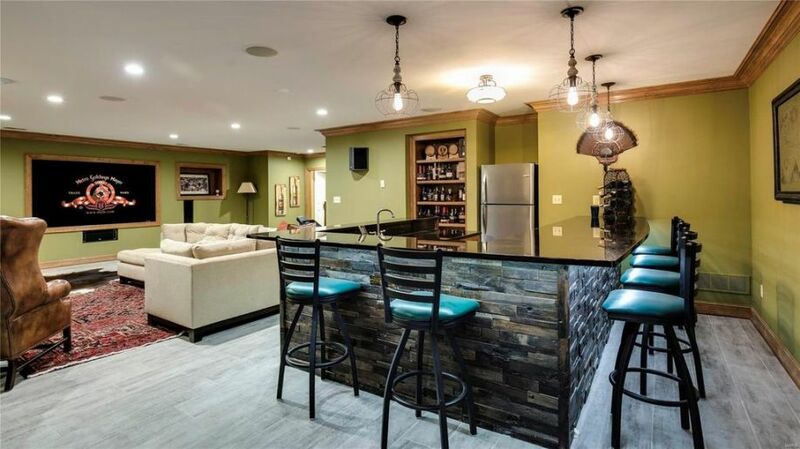 The second my wife told me that I could take over the basement I started the hunt for man cave ideas that I could use to create an awesome hang out for my buddies and I away from the kids. I knew I wanted to add a really cool bar with a lot of seating for when they came over to watch the game. I also wanted a large television and comfortable seating area with enough room for all of us. However, before I started on all of that, I decided to begin with the bar design. I saw this picture of a bar covered in stone veneer panels to give it an awesome rustic look. I have seen those at Home Depot recently so I think that I am going to recreate this look in my man cave. My wife and I enjoy our quality time together, but there's something we relish even more: our alone time. So when we remodeled our home, we carved out some personal spaces. 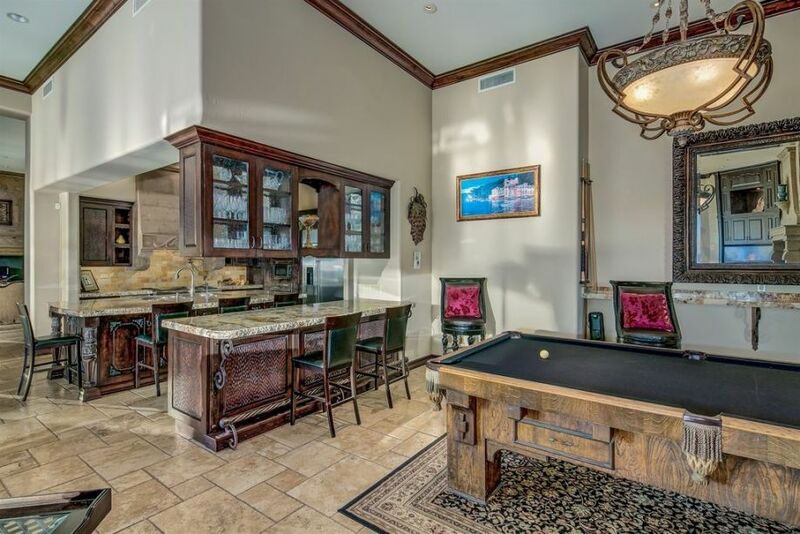 I chose the room with the fireplace, because it was wide enough for a pool table. We built a white stacked stone fireplace to anchor our design. The rest of the room would compliment it, including the bar. Man cave decor gets a bad rap as people think it's all Foosball tables and posters of heavy metal bands. I wanted something elegant; a room that felt more like a country club than a locker room. The combination of recessed lighting and light fixtures made it bright and cozy, not dark and dingy. This man cave is totally awesome and one that I am super jealous of. 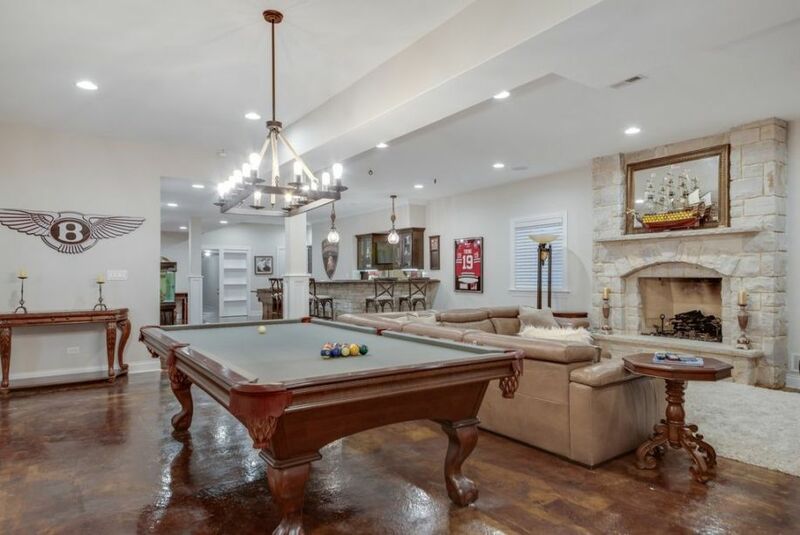 Most of the best man caves that I have seen are installed in a bonus room or basement indoors, I had never thought to convert the garage into a similar hangout space. It makes so much sense to do this though, because that is where I spend so much time working on my car and tinkering around in my small workshop. 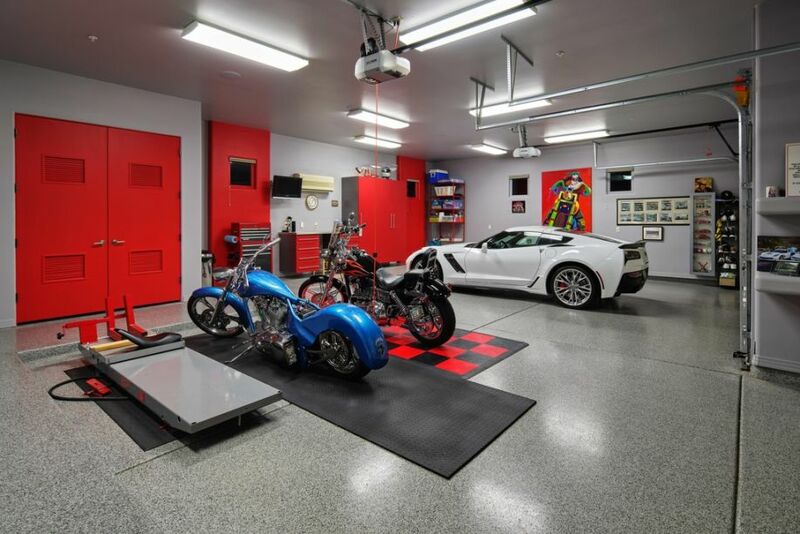 It would be so cool to jazz of the design a little bit to create a garage man cave that I could actually hang out in with my buddies. It looks like the projects that I would need to focus on area installing some sort of more formal floor (or maybe adding a veneer on top of my concrete) and investing in some cool tool organizers and a small bar or lounge area to entertain in.